January is School Board Recognition Month - It is truly our pleasure to salute the work of our school board members and celebrate all that they do to ensure our students receive the best opportunities available. 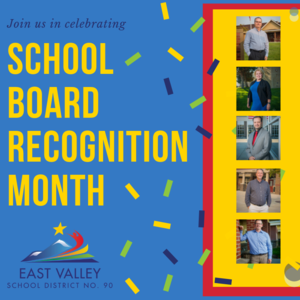 Please read more to celebrate our East Valley Board of Directors. January is School Board Recognition Month - It is truly our pleasure to salute the work of our school board members and celebrate all that they do to ensure our students receive the best opportunities available. As East Valley School Board members, each of these five individuals have assumed roles that preserve the core of our democracy in public education. They work diligently, as elected officials, to develop policies and make tough decisions on our behalf. They help shape the future of education and our East Valley Community. 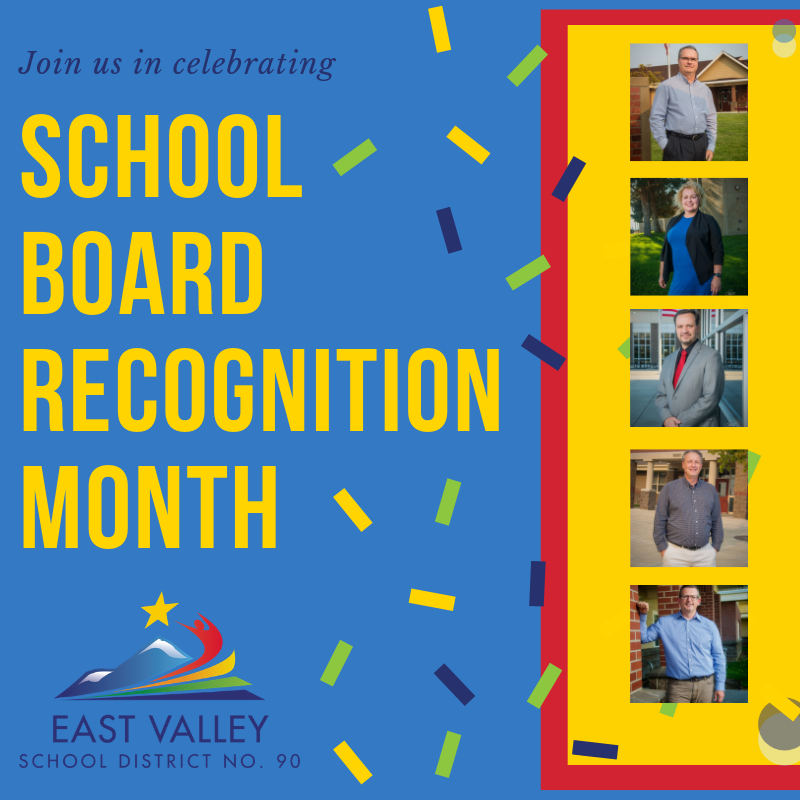 We ask that you join us in thanking our East Valley Board of Directors for their continued commitment to our schools, our students, our staff and our community. Matthew Byers has always had an interest in politics. After graduating from Central Washington University, he moved to Tacoma. He considered running for Tacoma City Council, but before the opportunity presented itself, he and his wife Julie decided to move to a smaller city to begin their family. The Byers made the move to East Valley in 2001 and have been invested in the community ever since. When the District 1 School Board position became available, Matt saw this as his opportunity to take an active role in his community by ensuring that the kids of East Valley receive a great education. Matt works for the Social Security Administration as a Claims Specialist. Before this, he spent 10 years in Human Resources. His work experiences guide him in his role with our District. When Matt isn’t working, he enjoys spending time with his kids, helping them with their various projects, like Gabbie’s photography business and Caleb’s passion for engineering. His only break is a few short winter months, when he isn’t coaching Lilli’s soccer team. Matt enjoys fishing and hunting and working on projects at home. Anyone who knows Charlotte, often wonders if she ever sleeps. Aside from her work with the District, she has a full-time job working for the Washington State Traffic Safety Commission, she artfully masters the role of LulaRoe Owner and Operator, she owns her own screen printing company and she still finds time to make monthly meals for Rod’s House, but before all of this she is a mother and a wife. Charlotte’s son Cash currently attends East Valley Central and her husband, Rob Layman, was just elected to the Moxee City Council. Charlotte is a sports enthusiast and in her “spare” time can be found supporting her son Cash out on the baseball field or rooting for the Hawks at CenturyLink Field. Charlotte joined the Board in an effort to serve the community by helping to improve communication. Her expertise in the field, paired with her charitable nature and unbelievable energy have been a great asset to our District. When the opportunity to serve our community arose last fall, Seth Basford gladly accepted the appointment to the East Valley Board of Directors. He enjoys his active role in guiding our District as his children grow. A native to the Yakima Valley, Basford went to grade school in Naches and then transferred to Selah for high school. He married his wife, Lindsey (Penning) Basford, 14 years ago and settled down in her stomping grounds, here in East Valley. Together they have 4 boys: Logan (13), Haiden (11), William (6) and Thomas (1). Basford works for Country Financial, helping others with insurance, investments and life planning. He is very active in his church and has been a Scout Leader for more than 11 years. He likes playing board games and enjoys a good tennis match. While he is a true 49er fan, he enjoys watching the Patriots and the Seahawks play as well. Our newest member to the Board of Directors, Ray Wiseman, was elected and appointed to his position in late 2017. Wiseman ran for this position to give back and make a positive difference in his community. Wiseman was born in Phoenix, Arizona. After moving around a bit, he ended up in Harrah, and then transferred to East Valley where he finished his education, graduating from East Valley High School in 1985. After growing up in Selah, Eric Farmer and his wife of 14 years, Jessica, decided to make the move to Moxee. Although they outgrew their first home, they didn’t want to leave the great friends and community they had found here in East Valley. In 2015, Eric decided to serve his District to ensure continuous improvement in education for his children and those of his fellow East Valley families. Together Eric and Jessica have 4 kids: Logan (12), Emmett (10), Madeline (7) and Timothy (4). Right now Eric is gearing up for his busy season as a tax accountant at Moss Adams LLP. When he’s not working, serving our board, or playing with the kids, you can find him skiing, mountain biking, enjoying delicious food or rooting for his BYU Cougars!